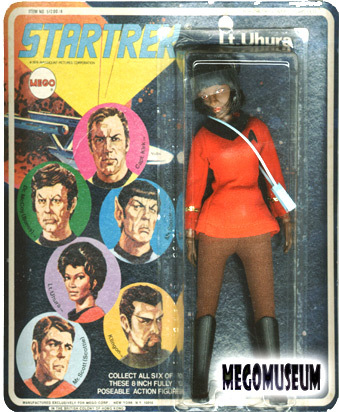 Lt. Uhura (Item No. 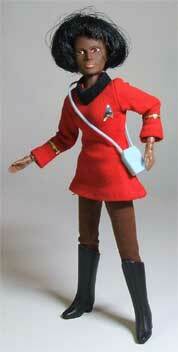 51200/4), communications officer of the Starship Enterprise, as portrayed by Nichelle Nichols. The head sculpt on this figure is, regrettably, kind of “blah,” reflecting more of a generic female face than the character itself. It’s serviceable, but it wins no awards for modeling. However, it is to Mego’s credit that this figure exists at all. The manufacture of this figure flies in the face of all the frugality and economy that Mego traditionally holds dear. They could have easily made Chekov or Sulu as a sixth edition to the first series, since they already wear practically the same uniform as Kirk. However, the toymaker took the higher and rockier road, patterning an entirely new uniform top for this lone, female, African-American figure. A blue tricorder served to complete the ensemble. 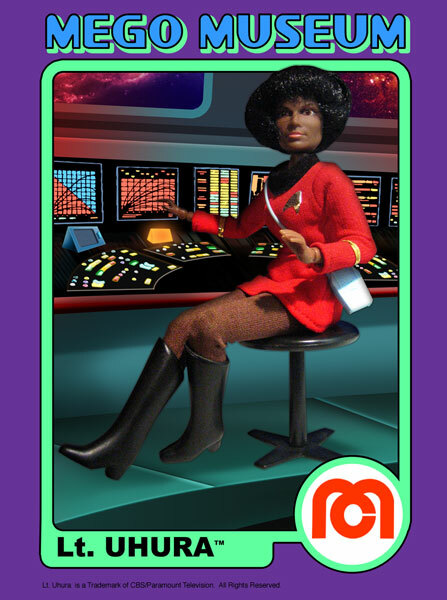 Lt Uhura on a “6-face” card with the name in white lettering. 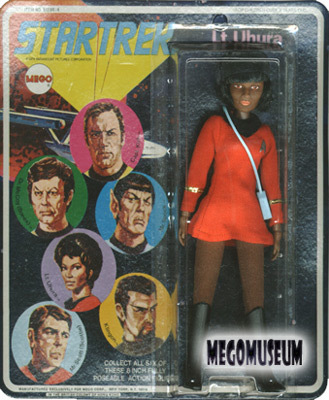 Uhura’s boots are unique to the character and have been factory reproduced by Doctor Mego and EMCE Toys. 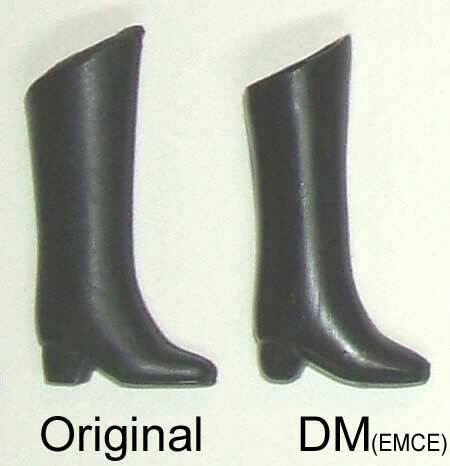 The repro boots are a little shorter, the plastic itself is a little thicker, and overall more glossy in appearance. The sets purchased as boots only through Doc Mego are stamped DM on the bottom, the version that comes on the EMCE Uhura figure do not have the stamp. 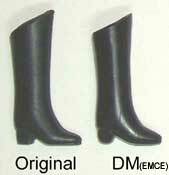 Otherwise the repro boots from both sources are identical. Star Trek crew figures have a 2 layered emblem. It’s a gray plastic type material with a silver foil on the top. The foil tends to fall off over time leaving the gray part of the original emblem. A complete emblem should have the silver foil. The emblem has been factory reproduced on the Emce Toys version of the figure. The Emce version is larger, especially in width, and is a single layer, thicker material. Spock, McCoy and Uhura all sport the same tricorder. The blue plastic on the originals can take on a greenish hue over time. 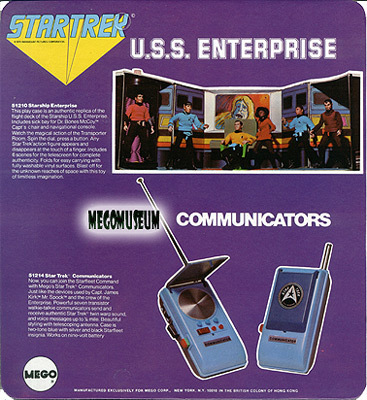 The tricorder has been factory reproduced by EMCE Toys. The reproduction has a slightly different shape for the unit itself. More rounded around the top corners, where the top “corners” on the original are flat, creating 6 distict sides. The details on the face of the original are raised, where the opposite is true on the reproduction. EMCE’s details are recessed. An original will also have the number 7 imprinted on the back (the repro doesn’t have this), and the repro is made of a more brittle plastic so the strap breaks easier. 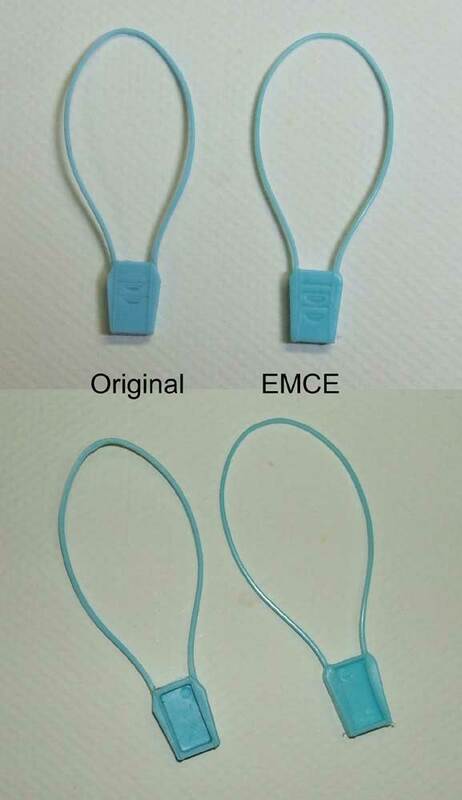 The EMCE version is unmarked. What can be confusing about this is the repro phaser has a 7 on the handle and the original does not, but the repro tricorder is unmarked while the original has a 7 printed on the backside. Bascially what that means is the 7 mark does not mean repro on all Trek items. 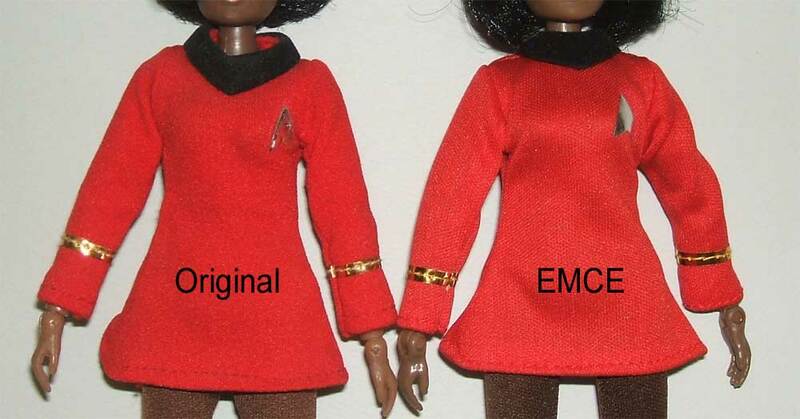 Uhura’s dress has been factory reproduced by EMCE Toys. The reproduction is very close in appearance to the original. The biggest difference is the material. The EMCE version has a slicker material. The repro dress is overall a little shorter than the original, and fits a little tighter around the neck. The rank stripe on the cuff is identical to the original. The repro is unmarked. 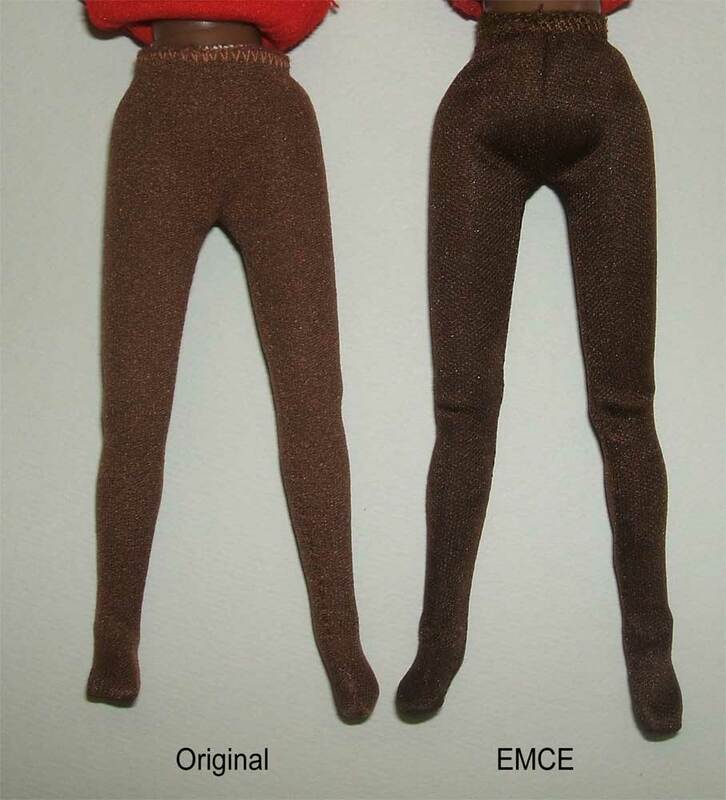 Uhura’s pants have been factory reproduced by EMCE Toys. 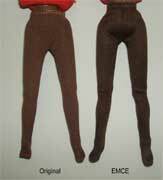 The reproduction is a little darker in color than the original and fits a little tighter around the waist. The biggest difference is the material. The EMCE version has a slicker material. It is unmarked. Uhura’s head has been factory reproduced by EMCE Toys. There is some differences in shape and size of the reproduction and the original. The upper half of reproduction is larger than the original although the lower half seems about the same size this makes the reproduction look a little more oval overall than the original. The hair is a little longer, and the seam where the hair is rooted in the head gives the reproduction head an almost parted look. The repro is marked with the 2008 CBS copyright stamp on the back of the head under the hair.